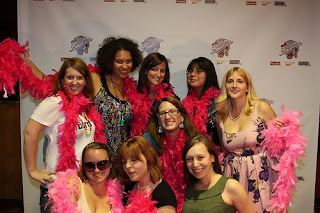 One of the coolest things about the BlogHer conference is meeting other bloggers and all the after parties and events going on around the show! Here's a recap of the top seven highpoints for me. 1. Received photo tips from Queer Eye For the Straight Guy's Carson Kressley. At the exclusive Nikon Night Out Party each guest could walk the carpet and strike a pose and then the Fab 5 guy himself gave us some pointers on How To Look Good in Pictures. He told me to keep my face level, not pointed up or down, but level. He also liked how confident I stood. I was really impressed at how super friendly he was and not in a fake way either. 2. Met WalMart 11 mom bloggers, Mommy Brain Reports and Consumer Queen, who I've only emailed and tweeted with in the past. 3. Took a photo with a HUGE Enigizer Bunny and got to bang his drum at the EnergizHER suite party. 4. Rode in the Wiener Mobile. I recently spotted this hot dog on wheels in Los Angeles (post here), but this time I got to ride "shot bun," and you'd be amazed at how much fun it was. As we drove around the Chicago city blocks, everyone would stare and most would wave. I had my hand out the window and was waving back like I was riding on a float in a parade, lol. They also let me talk on their speaker that broadcasted what I said out to the onlookers. I told the crowds, "Have a franktastic day everyone." I loved it and made two shout outs even. Also, the wiener mobile's horn would play the retro version of a child singing "how I wish I was an Oscar Meyer wiener," which caused fellow blogger, Jamie and I to crack up each time. 5. 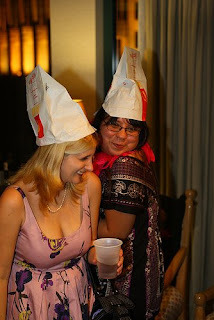 Wore a McDonald's paper bag on my head along with over 200 other bloggers at the CheeseburgHerz late night party. I wrote "Frankie Say Relax" on mine. Not sure why. That was after a few glasses of wine, but one girl there said she thought it was funny. 6. Rocked a pink boa at the Lucky Strike bowling lanes at the BowlHer party with Katelin, Jamie, Jessica, Heidi, Jenn, The Modern Gal and other awesome ladies. 7. Saw Project Runway's Tim Gunn, but didn't want to wait in line to meet him though. 3. Jet lag, kept going to sleep at 2 to 3 a.m.
haha love all the pics. and woo for carson, so fun! seriously loved hanging out with you this weekend, such a great time. Hahaha I don't even remember you writing that on your McDonald's hat! Looks like so much fun! I am definitely going next year! I hope Blogalicious 2009 is nearly as fun. I love that picture of you and Carson. SO BUMMED I missed him. It was awesome hanging out with you this weekend! yay for Carson being awesome. Everyone's post I've read has nothing but great things to say about him. BTW, chicklit rocks in my book. ahhh Tim Gunn!! I love him!! Meeting you was one of the highlights of my Blogher trip- great to share a meaningful and fun conversation...Just saw a rough cut of the yahoo.com video and of course you're in it!! Say hi to your super -adorable husband for me-- one of the best, how I met my husband stories EVA!